Sea ice algae grows underneath and in the sea ice. It grows with the help of sunlight that filters through the sea ice. The sea ice algae team is measuring the quantity of sea ice algae and phytoplankton (algae that floats in the water), what species are present, and how much photosynthesis they carry out. They’ll collect data by drilling through the sea ice with an ice auger, then catching particles of algae in sediment traps that hang under the sea ice. I will be part of the sea ice and food web team on board the Healy. Back in the home lab I will be in charge for the analysis of stable isotopes. I have always been fascinated with the polar regions. After spending much of my previous career working in the Antarctic, I now enjoy working in the Arctic regions. So far, I have participated in about 15 research cruises to the Antarctic, the Arctic and the Deep-Sea. My background is in benthic (organisms living at the seafloor) ecology, especially trophic interactions and food web studies. I was born and raised in Germany and came to the US ten years ago. 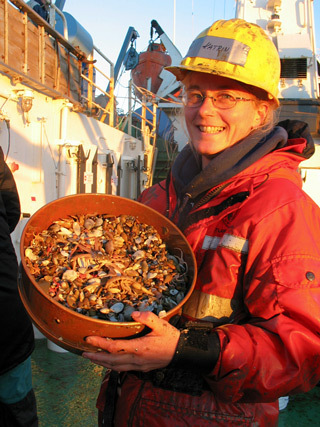 I hold a position as Associate Professor in Marine Biology at the University of Alaska Fairbanks. I enjoy Alaska with its abundant nature and wildlife.